This is how my surgeon suggests I begin my blog post, when I tell him – during surgery! – that I shall write of my experience. Truthfully, though, it is his warmth and ability to comfort that most impresses me, which seems to me the very model qualities of a healer. And this is what I shall write about – oh, do rest assured I shall spare you the details of cutting and suturing. I am at VGH/UBC eye care surgical clinic to have a lower lid elevation, a procedure performed with local anaesthetic, and sedatives, if requested. The surgery is required because of what is called thyroid orbitopathy, an autoimmune disease of inflammation and enlargement of the muscles and tissues surrounding the eye. The disease is associated with hyperthyroidism, although some people, like myself, have no abnormalities of the thyroid. Its cause remains unclear, but it can be disfiguring, and severe cases may compress the optic nerve, leading to sight loss. Even in its relatively mild manifestation, the eyes are uncomfortable, and retraction of the lids causes a stare which has many psychological effects in interactions with others. There is no cure for the disease, though various remedies to help with symptoms. So I’ve skipped over this bit about as quickly as I can, the point of which is to say this is oculoplastic surgery, certainly not cosmetic. I am here for the second time at the clinic, having some years previously undergone a mullerectomy, a procedure to lower the upper eyelids. It was a good experience, but it was really my experiences after the surgery that were so very enlightening. Almost immediately I noticed a profound difference in the way other people related to me; people were more relaxed. The stare associated with the disease is at best interpreted as intensity, and at worst, as anger – and the (relatively) small changes in the appearance of my eyes apparently alleviated these impressions. Family and close friends have familiarity on their side in interpreting mood and speech, but body language is a large component of communication, and the eyes a large component of body language. The subtle and intricate play of these muscles is indeed, how we invite others into our hearts and minds, and perhaps truly are the windows of the soul. I am here, then, because I have seen the transformation that can be effected, aside from the fact that I am in discomfort. And I am here because this is a place of healers, and the healing art. Everyone, from receptionist to nurses to doctors , introduces themselves, and speaks with a care for privacy and with evident compassion. It is clean, and quiet – though soft music plays in the operating room. The anaesthesiologist explains that the effect of the sedative is similar to two glasses of red wine, and I heartily endorse this. The surgeon explains – fortunately, with not too much detail – each various step he takes in the procedure. I tell him his voice is very soothing. The surgeon also guides and converses with another surgeon who is there to learn the art and technique – for this is a teaching clinic. I confess this is somewhat disconcerting, though her gentle touch on my arm is welcome. Everyone moves about in a sure, quiet way, and at the point where I am somewhat convinced I am going to scream – not in pain, for there is none, but my muscles are being pulled about a bit – the surgeon tells me he is finishing up. When the surgery is finished, a nurse helps me out of the operating room chair and into the recovery room, stopping along the way to show me my new eyes. Squeamishly, I avert my eyes – I am such a girl – as I catch sight of a drop of blood. And so, my imaginary friend asks, what is the point of this foray into the intensely personal, this disquisition on what many of us would rather not hear about, thank you very much? Just this, my friend: it is a marvelous and wonderful privilege to be in the company of health care professionals who clearly enjoy what they do, who work to provide patient-centred care, and who strive to become better at what they do. Obviously, no one wants to have surgery, and this is assuredly not enjoyable, but to enter into this place is to enter into the presence of healers, and that is a gift. It is a gift because this place is much different than other places I have had surgery, although this is a subjective view. That is precisely the point: the patient’s subjective view has much to do with the process of healing. And it is a gift, because in a world that often values the tawdry and superficial, here is a statement that perhaps real and enduring values shall prevail. It is also a political statement, in a deep and profound way. Health care does not need more surgeons who stride confidently into the operating room, but rather, I believe that health care needs more people who go quietly and compassionately about their work with great love. My warmest thanks to Dr. Peter Dolman, and each and every one of the staff at VGH/UBC surgical daycare, my thanks and much love. You have shown me, and many others, what the healer’s art should be. How fortunate I am, and I mend very well. February 1st has been celebrated as a seasonal holiday by a variety of cultures, most familiarly in the northern hemisphere as the harbinger of spring. The trees begin to bud, while deep underground the first stirrings of plant growth come to life, even under cover of snow. 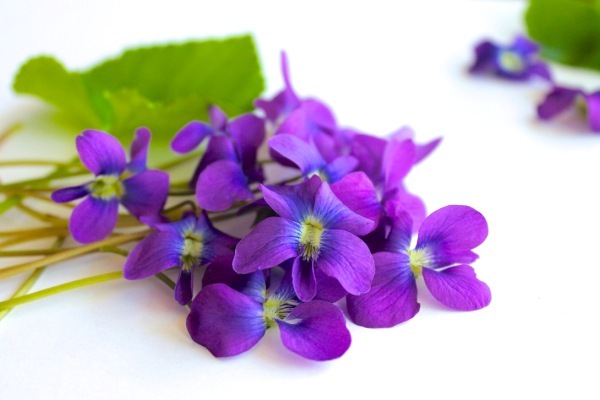 That most loved and useful flower, the violet, is the flower of February, its delicate beauty a charming evocation of both tenderness and hardiness. It is a month of quickening, of becoming alive to possibilities. The energies of winter slowly disperse and we prepare ourselves for the burgeoning time ahead. I prepare myself for change, not knowing what the future holds, yet anchored in the seasonal changes all around me in a sure and certain way. It occurs to me that older cultures rooted in the time and tide of nature and her seasons must have experienced much less anxiety than we, simply because of this intimate knowing of what the seasons hold, if not the intimate details of one’s own unfolding. Quickening is surely a most apt word for the life not yet born, yet preparing itself to be born. The violet, again, symbol of constancy and faithfulness and willingness to take a chance at happiness – ah, frail flower, you are worthy of a meditation. Unfolding, becoming alive to the possibilities, feeling the yet faint pulse of seeds planted long ago, trusting that the seasons will bring forth their treasures and beauties in the fullness of time…I find that February is a lovely place to be. I hope it is so for you also, my imaginary friend.